312 pages | 23 B/W Illus. The general elections held in 2014 in India — the largest democracy in the world — to elect the 16th Lok Sabha brought in dramatic results. This important volume explains not only the startling victory of the Bharatiya Janata Party (BJP) but also the equally surprising downfall of the Congress Party. It examines not why BJP won and the Congress lost, but why the scale of BJP’s victory and that of Congress’s defeat was so very different from the results in the years 2004 and 2009. The volume presents an in-depth analysis of the electoral results, state-wise studies, the factors leading up to these outcomes, and the road India has travelled since then. 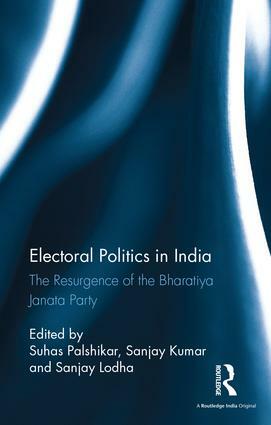 With contributions from India’s leading political scientists, psephologists, sociologists and political commentators, this book will be of great interest to scholars and researchers of Indian politics, democracy and political parties, as well as South Asian studies. "The collection’s essays, by leading political scientists, psephologists and sociologists, should interest all readers who seek an overview of national electoral trends in the run-up to the 2019 general election." Suhas Palshikar taught Political Science at the Savitribai Phule Pune University, Pune, Maharashtra, and is the Co-Director of the Lokniti programme, Centre for the Study of Developing Societies, Delhi, India. Sanjay Kumar is Professor and Director at the Centre for the Study of Developing Societies, Delhi, India. Sanjay Lodha teaches in the Department of Political Science at Mohanlal Sukhadia University, Udaipur, Rajasthan, India.